Photos taken 14th Sept 2013, on Cley Hill near Longleat, the final scrap of chalkland before you hit the older geologies of the West. 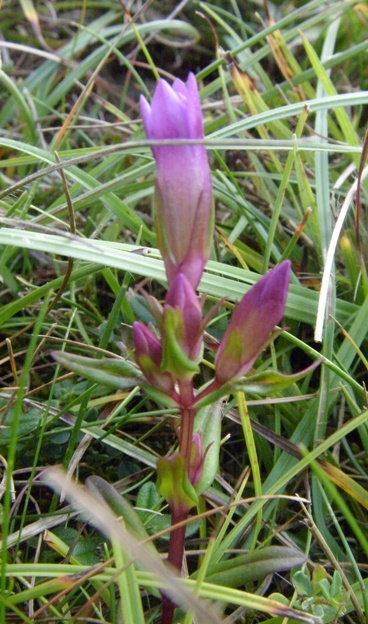 Above and below, Autumn Gentian (Gentianella amarella). It took a bit of searching around to track the plants down, on just one bank near the old chalk-quarry. 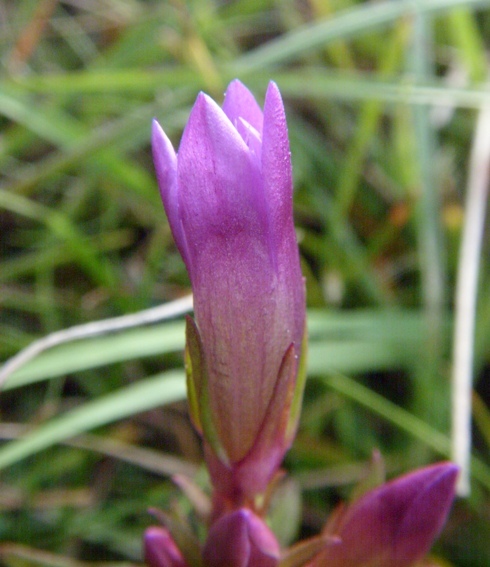 Like the Early Gentian (Gentianella anglica), which also grows on Cley Hill, the number of flowering plants fluctuates wildly from one year to the next. When we think of the freshness in the air, the Maxfield Parrish skies*, the curt abbreviation of twilight, the stars again, the morning mist, switching lights on in the morning, clicking up the temperature control in the shower, the condensation on the car windscreen, spiders' webs, bullying pheasants etc, then September fully lives up to its equinoctial role as a month of rapid changes. When, on the other hand, you look only at the plants around you, then the beginning of September really doesn't feel dramatically different from the beginning of August. True, the blackberries have ripened; the most luscious ones have already been eaten. True, there's a certain thinning in the foliage - the nettles, the brambles. A certain clarity, the sharpness of a bird's note. The structure of a single plant emerges suddenly against a more open sky-line - for instance, one fine clump of fruiting Deschampsia cespitosa (Wavy hair-grass) seen by thousands of queuing motorists every morning at M4 J16. But when all's said the changes at the start of September are subtle. It takes quite a bit of reflection (or good field notes) to realise that the larger willowherbs, those lovely mixed stands of Great and Rosebay, have unobtrusively finished flowering. Most of the late-summer plants are still around in some numbers. With the die-back of high summer's rankness (and, more particularly, human mowing and strimming) they may even become more noticeable. Meadow Cranesbill, for instance, pokes a new garland of flowers above the bypass fringe. Lucerne (=Alfalfa) is another purplish bypass flower that has certainly been around since July but always seems to be at its most noticeable now, in early September. The relatively slow change of the plant landscape through August is down to something that most residents will find hard to conceive: the UK has more summer than it needs. That is to say, it has more growing season. And when I go further south (i.e. to southern Spain), the growing season has a midsummer recess when it becomes too hot and arid for most plants. In fact there are really two growing seasons, March-June and Sept-Nov. The upshot of these different summer patterns just to north and south of us is that in the UK there is just the spectral trace of a Mediterranean recess. August is a good growing month here, but no plants really need that extra month; if they did, it would limit their geographical range too much. The extra month is just a nice-to-have. Gardeners will understand this better than most botanists. The plants have options. 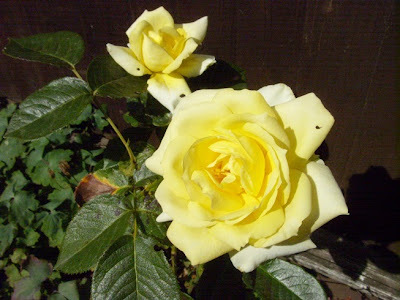 By slight preference, they'll devote August to nurturing an extra-special crop of fruit. But they can equally well use it to produce more flowers, and that's what they'll do if their first crop of flowers has met with some mishap. 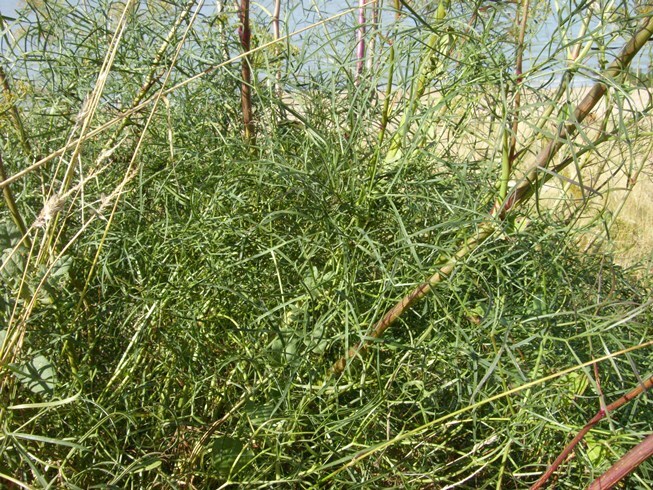 Therefore a diligent dead-header can make the same plants produce fresh flowers all through the summer. Even if you don't dead-head, a fine early September is likely to produce a few second flowerings. The plant stirs, the shorter days and the moisture remind it of happy spring. And some of its nostalgia comes forth as real flowers. In Mendip towns the Red Valerians are nearly as colourful as they were in May; but they're now accompanied by a bewildering variety of bluey-mauve Michaelmas Daisies. Up on the chalkland, not that I've made it up there this year, you could have a nice winding hill-walk searching the nibbled slopes for lovely little Autumn Gentians and Autumn Lady's-tresses. I haven't even made it to the local Asda reserve, where various mud-loving Goosefoots (Goosefeet?) and Oraches will now be at their September best. 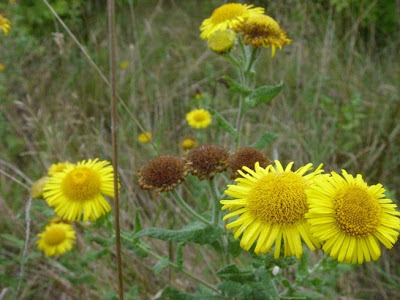 In standard lowland country, the most prominent flowers are Yarrow, Common Ragwort, Bindweed, Common Fleabane, Wild Carrot. Oxeye Daisies re-emerge sporadically. Almost as noticeable, the dark silhouettes of fruiting skeletons: lumbering burdock, black melilot, teazel and hemlock. In gardens, Perennial Sunflowers (close relatives of Jerusalem Artichoke) have just started. American Goldenrods are still going strong. Sedum blushing for the 9 AM bees. Asters, of course. Walking from the car-park, my eye catches appreciatively on freshly flowering groundsel plants - a premonition of December's sparse entertainments.Also, more unexpectedly, squinancywort and dwarf mallow. I'm suddenly conscious of the trees once more. Through the August recess these giants have been static, unchanging in appearance and unobtrusively feeding. I don't know if it was the dancing veils of morning mist that started me off, but now I'm uneasily eyeing the crowns. Are they on the move again? At the start of September the variations in tint are nearly all down to fruits, not leaves: the hawthorn boughs are red-tinged, the elder-tree full of black panniers, and the fools'-gold in the ash is ripening keys. Only the horse-chestnuts have rusty edges. And there's a handful of yellow leaves in the tall poplar plantation. For the moment it's still Summer. Just. In ten days' time, that handful will be a general yellow speckle. Not just poplars, but willows, hazels, field-maples, plum-trees and birches will have yellow leaves among the green. And there'll even be a few other colours: the sudden fiery orange of an occasional planting of Aesculus flava (Yellow Buckeye - the name refers to the flowers), or the pinky-red of the street-tree Prunus sargentii (Sargent Cherry). Autumn is starting. *Thanks to Laura for this description. Pictures from Tankerton (just to the E. of Whitstable harbour in N. Kent), taken on August 31, 2013 - too late to see the bright yellow flowers, at least on this particular plant. 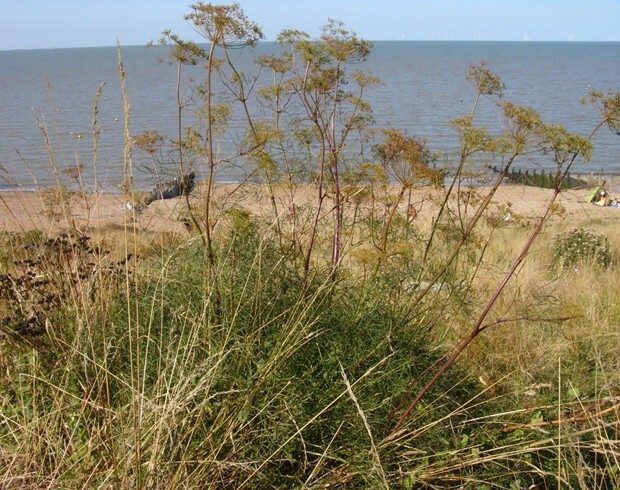 Though Hog's Fennel is a very local plant, you can hardly miss it if you visit Tankerton because it grows all along the sea-front, dominating the rough slope that separates the promenade from the beach. 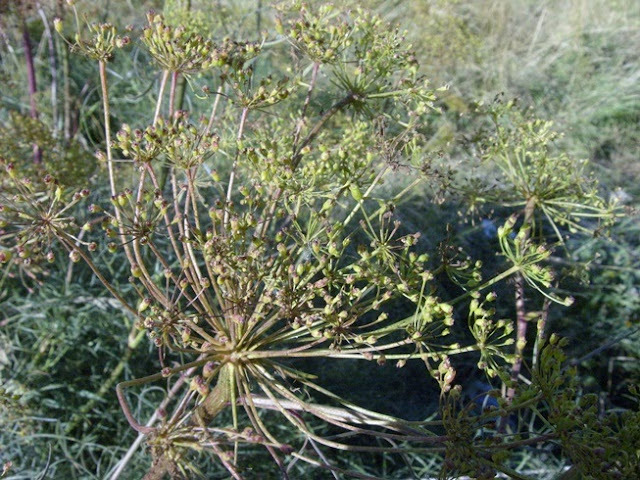 Umbel, the rays typically crowded, with young fruits developing. 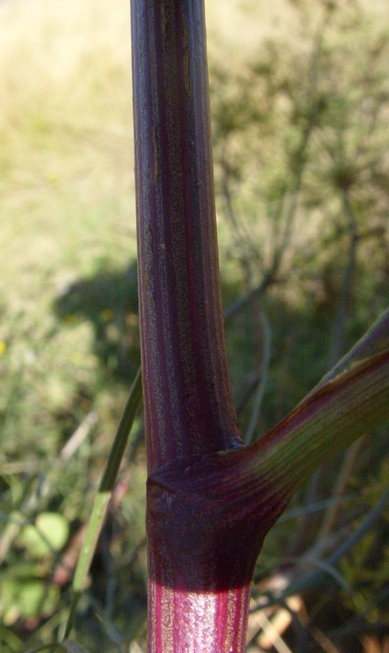 Stem - smooth, hairless, with attractive striping.